Here Is A Simple Step By Step Guide That Shows You Exactly How We Mix Professional Quality Beats. Are You Sick Of Spending Hours Making A Beat That Can't Compete With Professional Productions Because Of Mixing? Are You Struggling to create a lot of great beats because you are wasting hours struggling through your mixes? Are you sick of not being able to create a great mix because you are overwhelmed by the complexity of the mixing process and are not sure what the right adjustments are that you need to make? Or maybe you have some of the mixing process down but you can’t seem to put it all together to create a high quality mix. The Truth is...If you don't know how to mix it's nearly impossible to make great sounding beats. FACT: What Really Separates The Pros From The Amateurs Is Their Ability To Mix. Mixing is one of the most Important parts of making a beat and unfortunately, it is the most misunderstood part of beat production. Without the ability to mix you will struggle to get your beats to hit hard. Your productions will lack clarity. And you will struggle to make great sounding beats. You will find that you just can't compete with other producers without the skills to create a high quality mix. Is there a system or formula for creating a great mix? We create beats and music across many different genres of music and I have personally spent years intensely studying the techniques that work for creating professional quality mixes, and spent thousands of dollars to learn this material. And that’s not counting the many, many hours and years of experience learning common mixing techniques and processes used by the pros. It has been a long journey to learn what we have built into this Incredible Beat Mixing Guide. 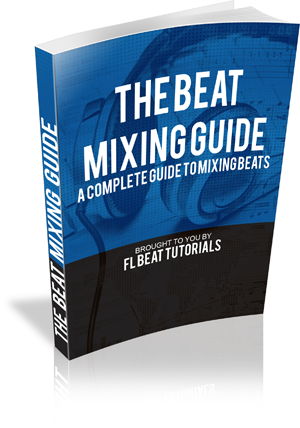 And one of the Biggest questions we get asked at FLBeattutorials is how to mix beats? That's why we created a simple, step by step guide, that covers exactly how to mix professional quality beats. The good news for you is that we've done all the hard work, made all the mistakes and figured out what works (and what doesn't). A lot of research, testing methods, and putting them to use went into this guide. That's why we carefully crafted this guide showing you exactly WHAT WORKS, into a simple, easy to use guide. This is the EXACT process we use to mix beats. In the past this guide was just for me but now I am making a select few available to the public. So now you don't have to do it alone. Normally this guide would sell for $47 - $97, but for a very limited time I am dropping the price significantly and I’ll let you have instant access to this guide for just $7. For The Price Of A Burger Meal You Could Start Mixing Professional Sounding Beats. You could start making hard hitting beats. You could take your production skills to the next level. 1. We want this training to be in the reach of everyone from the bedroom producer to the full-time producers making a living from beats. 2. There isn't another training out there for this price. Most training of this quality is $50 and up. Learning to mix is extremely important but if you really want to take things to the next level you should upgrade to our complete producer package. We believe once you try this guide you’ll want more and maybe, just maybe, you’ll come back and buy our complete Beat Guide Library. No fine print...just the information you need and the results you want. Absolutely...all of our trainings have a 60-day, no questions asked guarantee. How Long Will It Take To Access This Guide? Once you purchase this guide you will be given instructions on downloading your guide.